The weather is getting warmer, and that can mean only one thing: it’s time to take your dog to the great outdoors for some sporting activities. If you have a purebred dog, the American Kennel Club offers many options for you and your dog to show off the natural talents for which they were bred. In our next issue, we’ll look at the sports for everybody’s favorite breed, the mutt-i-gree. The highest level of Rally, known as Excellent, may have as many as 20 stations and handlers are not permitted to encourage the dog other than by verbal command. Earthdog Tests are a non-competitive way to measure the natural aptitude and trained underground hunting behaviors of small Terriers and Dachshunds. You can enter your dog if he or she is of an eligible breed, whether or not you have registration papers. For novices, there is Introduction to Quarry, which teaches both dogs and their families about the sport and what is involved. Junior Earthdog requires the dog to travel a 30-foot den with at least three right angle turns in 30 seconds and work the rats at the end of the tunnel for 60 seconds. Senior Earthdog adds distractions such as a false exit. Master Earthdog includes having the dog hunt his way to the den at the start of the test. In addition, the Master Earthdog test includes two obstacles which the dog must overcome inside the den. Your reward at each level is a ribbon. Your dog’s reward is exercise and a day of fun playing with the other dogs. I’m not sure what the rats get out of it. Tracking is classified by the American Kennel Club as a Companion Event because it allows you to spend some quality time with your favorite four-legged buddy. It is non-competitive and helps your dog hone search and rescue skills. Like Earthdog Tests, your dog must be a purebred, but does not have to be registered with the AKC. There are no specifications as to the particular breeds eligible – all are welcome as long as they are purebred. Think your dog’s got a great sniffer? Tracking might be just the sport for you. The dog is put into a harness on a 20 – 40 foot lead and taken to an open grassy field where he simply follows his nose along a scent trail to find the items previously laid down by officials – sort of a doggie Easter Egg Hunt. Novices must take a class first and be certified as a Tracking Dog before attempting events. A typical Tracking Dog course is between 440 and 500 yards and contains 3 – 5 changes in direction. There are no obstacles and the first thirty yards are marked with flags to get you started off in the right direction. There is no time limit as long as the dog stays on the trail. Once your dog has earned his Tracking Dog (TD) status, he can advance through Tracking Dog Excellent (TDX) and Variable Surface Tracking (VST) to become a Champion Tracker when all three awards have been earned. For the TDX title, the trail become harder to follow, with longer distances, more turns, diversionary tracks, and older scent trails. Variable Surface Tracking includes dropped items of different textures such as leather, cloth, plastic, and metal, and requires the dog to travel over several types of surfaces to test his or her ability to work in an urban environment. 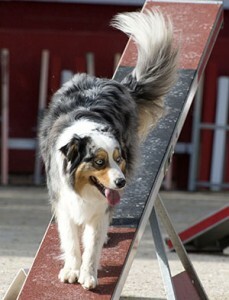 Another of the AKC Companion Events, Rally is a companion to the more rigorous obedience competitions. The dog is led through a course of 10 – 20 stations, with each station having a sign indicating an exercise to be performed. Exercises might include things like turning in a circle, jumping from a platform, and backing up with the dog in the heel position. Novices begin on an easier course with fewer stations, more interaction between the handler and the dog, and easier exercises. Advanced competitors have more difficult exercises and the dogs are worked off-lead. The highest level of Rally, known as Excellent, may have as many as 20 stations and handlers are not permitted to encourage the dog other than by verbal command. At the start of each competition, each team has 100 points. Deductions result from incomplete or incorrect performance on one or more of the stations. Any team who finishes the course with at least 70 points retained is said to have a qualifying performance. Teams are ranked according to the number of points they retain. If two or more teams earn the same score, the one with the shortest time on the course is the winner. For sighthounds like Greyhounds, Afghans, Borzois, and Whippets, the AKC has an exciting sport called Lure Coursing. The event is open to all eligible purebreds, whether or not they are registered with the AKC. Lure coursing is a sport for sighthounds. Lure coursing is not a competitive sport, although there may be more than one dog running the course at a time. The goal is for each dog to complete the course successfully, not necessarily to beat the other dogs. Success is defined as chasing a white plastic lure that runs along a wire for 600 to 800 yards in an open field. For novices, the Junior Courser title offers a 600-yard course with four turns, through which the dog runs off-leash and solo. At the Senior Courser level, your dog must run with at least one other dog. From there, the dog can compete in Open Stakes to earn a Field Championship Title, a Master Courser Title, and finally a Lure Courser Excellent Title, which comes in levels such as LCX I, LCX II, LCX III as the dog earns progressively more points over the course of his or her career. For scent hounds, the AKC offers a number of different events meant to hone and showcase your dog’s ability to hunt. Events are divided according to the type of hunter your dog is, such as pointer, retriever, or spaniel. Follow the links to see eligible breeds. There are also separate trials for Beagles, Basset Hounds, and Dachshunds. If you’re new to this, pointers corner the prey then literally stop and point to it, retrievers bring back the dead prey from land or water, spaniels typically flush out the prey (although they also retrieve it), and hounds corner the prey then bay to tell the hunter where they are. Trials may be field-based where the action is simulated, while hunting trials include actual prey such as birds, rabbits, or squirrels. For more information on all of the scent hound trials, search for a club near you. The last of the performance sports from the AKC is herding. In this event, eligible breeds are judged on their ability to control and drive livestock. The first test is a measure of instinct, where the judge looks at the dog’s ability to respond appropriately to commands while in the presence of livestock such as goats, sheep, ducks, geese, or turkeys. The dog must demonstrate a stop and must come back to the handler upon command. Further levels of accomplishment indicate the dog’s ability to move and control the livestock around pylons, gates, and fence posts on the course. 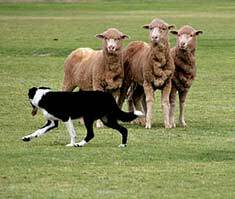 If you have a herding dog, herding trials may be the sport for you. For all of these sports, there are minimum age requirements meant to protect your dog while he is a puppy, and various other rules and eligibility requirements. The best way to find out about each sport is to attend an event and watch the dogs in action. In many cases, you can bring your own dog to watch an event, and talk to the competitors to find out if the sport would be a good fit for you and your dog. Find a club near you and go out to see the action! What are the Dog Groups?